The International Handbook on Innovation is the most comprehensive and authoritative account available of what innovation is, how it is measured, how it is developed, how it is managed, and how it affects individuals, companies, societies, and the world as a whole. Leading specialists from around the world, responsible for much of the current research in the field, analyze the multidisciplinary and multifaceted nature of innovation, its types and levels, its criteria, its development, its management, its specificity in various domains and contexts, and societal demands on it. They consider innovation from the viewpoints of psychology, management science, business, technology, sociology, philosophy, economics, history, education, art, and public policy. With contributions from over 90 distinguished authors covering 17 nations, readers will obtain expert insight into the latest research and future developments in the field of innovation. The Handbook will present many facets of innovation including its nature, its development, its measurement, its management, and its social, cultural, and historical context. The breadth of this work will allow the reader to acquire a comprehensive and panoramic picture of the nature of innovation within a single handbook. The reader will develop an accurate sense of what spurs potentially creative and innovative people and companies toward their extraordinary achievements and exceptional performances. The handbook can be used as a reference source for those who would like information about a particular topic, or from cover to cover either as a sourcebook or as a textbook in a course dealing with innovation. 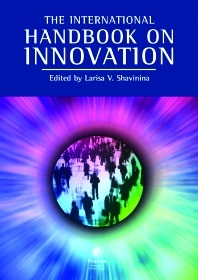 Anyone interested in knowing the wide range of issues regarding innovation will want to read this handbook. Researchers, practitioners and students in the fields of psychology, management science, business, technology, sociology, philosophy, economics, history, education, art, and public policy. Introduction. Understanding innovation: introduction to some important issues (L.V. Shavinina). The Nature of Innovation. The neurophysiological basis of innovation (L.R. Vandervert). On the nature of individual innovation (L.V. Shavinina, K.L. Seeratan). Models of innovation (D. Marinova, J. Phillimore). Evolutionary models of innovation and the Meno problem (T. Nickles). The three-ring conception of giftedness: its implications for understanding the nature of innovation (J.S. Renzulli). Innovation and strategic reflexivity: an evolutionary approach applied to services (J. Sundbo). The nature and dynamics of discontinuous and disruptive innovations from a learning and knowledge management perspective (E.G. Carayannis et al.). Profitable product innovation: the critical success factors (R.G. Cooper). Types of innovation (R.J. Sternberg et al.). Problem generation and innovation (R. Root-Bernstein). The role of flexibility in innovation (A.S. Georgsdottir et al.). The effect of mood on creativity in the innovative process (G. Kaufmann). Case studies of innovation: ordinary thinking, extraordinary outcomes (R.W. Weisberg). Innovation and evolution: managing tensions within and between the domains of theory and practice (J.R. Bailey, C.M. Ford). E-creativity and e-innovation (Keng Siau). Individual Differences in Innovative Ability. The art of innovation: polymaths and university of the creative process (R. Root-Bernstein). Development of Innovation Across the Life Span. Young inventors (N. Colangelo et al.). Exceptional creativity across the life span: the emergence and manifestation of creative genius (D.K. Simonton). Innovations by the frail elderly (T. Heinzen, N. Vail). Assessment of Innovation. The measurement of innovativeness (R.E. Goldsmith, G.R. Foxall). Developing high potentials for innovation in young people through the schoolwide enrichment model (S.M. Reis, J.S. Renzulli). Towards a logic of innovation (G.F. Smith). The development of innovative ideas through creativity training (M.M. Clapham). Intuitive tools for innovative thinking (R. Root-Bernstein, M. Root-Bernstein). Stimulating innovation (R.N. Kostoff). Developing innovative ideas through high intellectual and creative educational multimedia technologies (L.V. Shavinina, E.A. Ponomarev). Innovations in Different Domains. Dimensions of scientific innovation (G. Holton). Do radical discoveries require ontological shifts? (M.T.H. Chi, R.G.M. Hausmann). Understanding scientific innovation: the case of Nobel Laureates (L.V. Shavinina). Innovation in the Social Sciences: Herbert A. Simon and the birth of a research tradition (S. Dasgupta). Poetic innovation (G. Swede). Directions for innovation in music education: integrating conceptions of musical giftedness into general educational practice and enhancing innovation on the part of musically gifted students (L. Scripp, R.F. Subotnik). Determinants of technological innovation: current research trends and future prospects (V. Souitaris). Innovation in financial services infrastructure (P. Nightingale). Innovation in integrated electronics and related technologies: experiences with industrial-sponsored large scale multidisciplinary programs and single investigator programs in a research university (R.J. Gutmann). Basic Approaches to the Understanding of Innovation in Social Context. The barriers approach to innovation (A. Hadjimanolis). Knowledge management processes and work group innovation (J.L. Farr et al.). Creativity and innovation = competitiveness? When, how, and why (E.G. Carayannis, E. Gonzales). Innovation tensions: chaos, structure, and managed chaos (R. Nag et al.). Involvement in innovation: the role of identity (N. King). Manager's recognition of employees' creative ideas: a social-cognitive model (Jing Zhou, R.W. Woodman). Venture Capital's role in innovation: issues, research and stakeholder interests (J. Callahan, S. Muegge). Innovations in Social Institutions. Encouraging innovation in small firms through externally generated knowledge (E. Major, M. Cordey-Hayes). Linking knowledge, networking and innovation processes: a conceptual model (J. Swan et al.). Managing innovation in multitechnology firms (A. Prencipe). Innovation processes in transnational corporations (O. Gassmann, M. von Zedtwitz). An analysis of research and innovative activities of universities in the United States (Yukio Miyata). Incubating and networking technology commercialization centers among emerging, developing, and mature technopoleis worldwide (D. Gibson, P. Conceição). Science Parks: a triumph of hype over experience? (J. Phillimore, R. Joseph). Innovation Management. Challenges in innovation management (J. Bessant). Managing technological innovation in business organizations (R. Katz). Towards a constructivist approach of technological innovation management (V. Boly et al.). Promotors and champions in innovations: development of a research paradigm (J. Hauschildt). Innovation and Leadership. Innovation and leadership (J.P. Deschamps). Innovation and Marketing. Innovation and market research (P. Trott). Marketing and the development of innovative new products (R.W. Veryzer). Innovation Around the World: Examples of Country Efforts, Policies, Practices and Issues. Innovation process in Hungary (A. Inzelt). Innovation under constraints: the case of Singapore (Hung-Kei Tang, Khim-Teck Yeo). Continuous innovation in Japan: the power of tacit knowledge (Ikujiro Nonaka et al.). Innovation in Korea (Sunyang Chung). Regional innovations and the economic competitiveness in India (K. Mehra). Innovation process in Switzerland (B. Wilhelm). Systems of innovation and competence building across diversity: learning from the Portuguese path in the European context (P. Conceição). M. Heitor). The Taiwan innovation system (Chiung-Wen Hsu, Hsing-Hsiung Chen). Innovation in the upstream oil and gas sector: a strategic sector of Canada's economy (A.J. Persaud et al.). The national German innovation system: its development in different governmental and territorial structures (H. Grupp et al.). Frankenstein futures? German and British biotechnology compared (R. Harding). Innovations of the Future. Future innovations in Science and Technology (J.F. Coates). The future of innovation research (T. Rickards). "...an outstanding compendium about the human knowledge about innovation, which deserves pride of place in the library of any any scholar interested in the advancement of science." —Technological Forecasting and Social Change, Vol. 72, Issue 1, 2005. "..a timely and monumental tome on innovation research" International Journal of Information Management, June 2004. "Deserves a place as a reference text for academics, practitioners and policy makers. ... [B]y providing critical questions and outlining new research directions, it makes a welcome addition to the innovation field." Dries Faems, Creativity and Innovation Management, Vol 13, No 2, June 2004. "Very well compiled in a logical order and there are ample ideas and framework for research on various facets of innovation in a variety of situations." K. Narasimhan, TQM Magazine, Vol 16, No 4, 2004 Larry R. Vandervert, American Nonlinear Systems "I have no doubt that the volumes will galvanize and guide the study of innovation for the next decade." Joseph Renzulli, University of Connecticut "This is really a comprehensive and innovative undertaking." George Swede, Ryerson Polytechnic University "...should be the defining work for decades." David Perkins, Harvard Graduate School of Innovation, USA "From the first campfire and arrowhead, the human condition has advanced through innovation. The International Handbook on Innovation examines with third-millenium savvy the fundamentals of innovation from the neuron all the way up to large-scale social enterprises. Innovation is a challenging theme, interpretable in so many different ways. If there's one resource I'd reach for, it's the author-rich and perspective-rich International Handbook on Innovation. " Ronald Goldsmith, Richard M. Baker Professor of Marketing, Florida State Univ. "The International Handbook on Innovation has been sorely needed; it will remain a comprehensive and essential resource for years."